Seasonal lawn and garden tips, plus informational articles about plants, gardening, landscape, lawn care and more! Microgreens and Sprouts: What is the Difference? RESTORING PEACE: Six Ways Nature in Our Lives Can Reduce the Violence in our World. Trees – Give Your Trees a Checkup! Bird Feeding is Wonderful Family Fun! Is Your Garden for the Birds? Trees – Give Them a Checkup! Bulbs are Just Like Eggs! The Best Time of Year is Now! Succulents – Some Like it Hot! Big Beautiful Blooms in Winter! Hillermann Nursery and Florist Among Retailers Recognized for Best Birding Retailer of the Year Awards at 2016 Wild Bird Expo™! Come Help Our Team Grow! If you would like to attract a variety of birds to your yard, a good way to do so is to offer a variety of feed. Putting out birdseed cakes are a good way to offer different types of bird food. 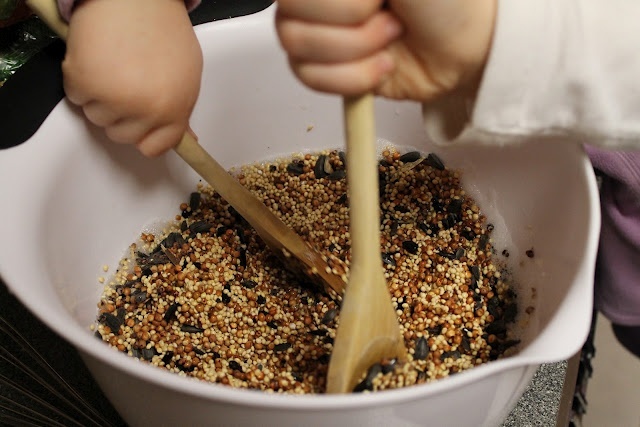 You can make seed cakes yourself and be rewarded with wild birds visiting your yard to feast on the treat that you made for them. All you need is just a few ingredients. Empty the package of unflavored gelatin into a bowl with 2 tablespoons of cold water. Let this sit for 1 minute. Add 1/3 cup of boiling water to the gelatin, stirring until the gelatin is dissolved. This is the binding ingredient to hold the seed cakes together. Add 2 cups of birdseed to the gelatin and mix thoroughly. Grease the cups of a muffin pan and divide the mixture between them. Place the muffin pan in the refrigerator for a few hours to allow the mixture to set. Once the cakes have set, remove them to the refrigerator and let them warm to room temperature before removing them from the pan. Drop the seed cakes into a suet cage and hang them outdoors for the birds to enjoy!